It’s with great sadness, but with a flurry of excitement, that I have to write this post. I have accepted a new job in the Boston metro area, which means that after spending most of my life in Milwaukee, I will be leaving. When my husband asked me last week, “What will you miss the most about Milwaukee?,” I hesitated. Obviously, I’m going to miss my family and friends. But then the answer quickly turned into a laundry list of food places. So, I thought I would say goodbye to Milwaukee (and Wisconsin) with a Top 10 list of the things I will miss most. On the flipside, soon I’ll have a Top 10 list of the things I’m most excited about in Boston and New England. I must apologize that with this move – there may be a little lag between posts. I’m doing my best to write posts in advance but it’s been a little hectic. Hopefully, I won’t be without high-speed access for long in the new digs. While I am gaining the Boston Red Sox and Fenway Park in the move, no other MLB team can say that they have Racing Sausages. I have a deep place in my heart for Guido, Stosh, Brett Wurst, Cinco and Frankie Furter. 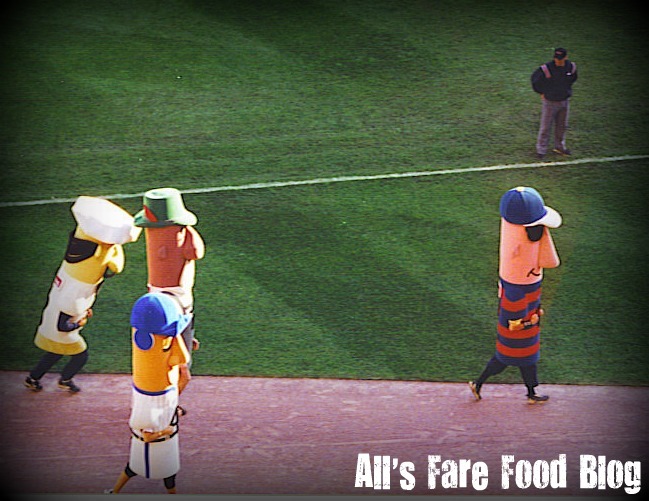 When I first moved back to Milwaukee after grad school, I had the great privilege of being a racing sausage…once. It was a horrifying experience that ended up on ESPN’s “Sportscenter.” (I had also been a sausage that went to greet people in the parking lot, but that also ended poorly.) However, it is also a cherished memory that very few can say they have had. The crisp crust. The tangy sauce. The pile of ingredients. Ned’s Pizza’s Perfecta has been the go-to pie at my family’s house since before I was born. My mom went into labor with my older brother while eating a Perfecta. With a heaping helping of cheese, pepperoni, sausage, mushrooms, onions and green peppers plus a side of cheesy garlic bread, it’s a comfort food that I’ll be hankering for. This family-owned supermarket is more than your standard box grocery store. It has the feeling of a close-knit family yet all the necessities of a big shopping trip. On weekends, you can get hot ham and rolls at a special price. If you’re in a hurry for lunch but want more than fast food, try Metcalfe’s salad and soup bar. I’ll miss having a grocery store so close to home. It made shopping a breeze after a long day at work. During the winter months and Lenten season I’ll definitely miss the weekly pilgrimage known as the Friday fish fry. It is a truly Wisconsin idea where groups of people come together to gobble down piles of beer-battered cod or haddock, fries and cole slaw. I love the fish fry at Lakefront Brewery, as well as the ease of the drive-through at Serb Hall. But you can’t overlook some of the great (yet smaller scale) church events in the area. There are so many products that have their roots in Milwaukee. Sprecher Brewery is one of the greatest finds anywhere in the country. I will greatly miss their seasonal brews as well as their great (and non-alcoholic) root beer and other soda blends. I did manage to sneak one four-pack of root beer into the car. Hopefully it makes it all the way to the east coast. Out of all the ethnic festivals that call Milwaukee home, Festa Italiana is my favorite. Plus, it’s the first one that I remember going to with my mom. How can you resist the fried eggplant, cannolis and other Italian treats? In 2009, I was even privileged enough to see PBS chef Nick Stellino conduct a cooking demonstration. If there’s one fest I can’t miss, it’s this one! When I first started college at UWM in 1999, I remember there was only one Alterra Coffee. Today, there are locations all over the area from Milwaukee’s lakefront to Wauwatosa to Mayfair Mall. I love my go-to drink of the Cafe Mocha with its rich chocolate flavor and strong espresso. But they’ve come a long way since I started college. Their breakfast burritos, soups, salads and bakery items rival even some of their best caffeine-laden beverages. Plus, I’ve even branched out to enjoy their Sportea (with a little bit of lemon) as a hydration favorite! Like many of the items that made this list, Champion Chicken is one of those that also has a long history with me going back to my childhood. In the mid- to late-80s, it was an annual tradition to go to Chickenfest at Champion Chicken. Or, head to the restaurant with a huge group of people after Greek Fest (then held at the Frank Lloyd Wright-designed Annunciation Greek Orthodox Church in Wauwatosa). My brother grew up with the owners so it has been a sort of family tradition of ours. Try the tailgate special – the great broasted chicken, fries, cole slaw and rolls for a nice price that won’t break the bank. Between fried cheese curds, Catalano’s fresh-squeezed lemonades, baked potatoes and other fried goodness on a stick, no state fair comes close to the culinary treats that come from the ﻿Wisconsin State Fair﻿. I was happy to see that my husband took to the fair when we moved here. It’ll be good to know that he will enjoy a trip back even if it involves gaining about 20 pounds just from eating our way around the fair grounds. Coming up with my No. 1 thing I would miss in Milwaukee was difficult. But what it came down to was the rich and creamy goodness that Kopp’s Custard churns out every day. It’s not something I’ll be able to get anywhere close to New England. Don’t get me wrong, they like their ice cream, but it just isn’t custard. It’s not as rich and the flavors aren’t as original (like Maple Syrup and Pancakes or Coco Kona Mac). It’ll be hard to get those flavor alert e-mails of my favorite flavors. Thankfully, they do ship cross country! Stay tuned…I’ll be back soon with the Top 10 things that I’ll be looking most forward to in Boston. In the meantime, keep cookin’! This entry was posted in Cuisine - American, Cuisine - Desserts, Cuisine - Italian, Cuisine - Pizza, Places - Milwaukee, Places - Wisconsin and tagged Alterra Coffee, Annunication Greek Orthodox Church, Boston, Cafe Mocha, Catalano's lemonade, Champion Chicken, cheese curds, Festa Italiana, fish fry, foods on a stick, Frank Lloyd Wright, fried eggplant, fried foods, frozen custard, Greek Fest, ice cream, Klement's Sausage Race, Kopps, Lakefront Brewery, Metcalfe's Sentry, Miller Park, Milwaukee, Milwaukee Brewers, Ned's Pizza, New England, Nick Stellino, Perfecta, Serb Hall, Sportea, Sprecher Brewery, State Street, top 10, Wisconsin, Wisconsin State Fair by Christina. Bookmark the permalink. A fish fry with a side of deep fried cheese curds, a Sprecher Amber beer, a pice of Ned’s pizza and a dish of Kopps Carmel Cashew ot Tiramisu custard. What could be more Milwaukee. Tiramisu custard – My hubby’s favorite. I’ll be missing the strawberry and Bienenstichkuchen the most. 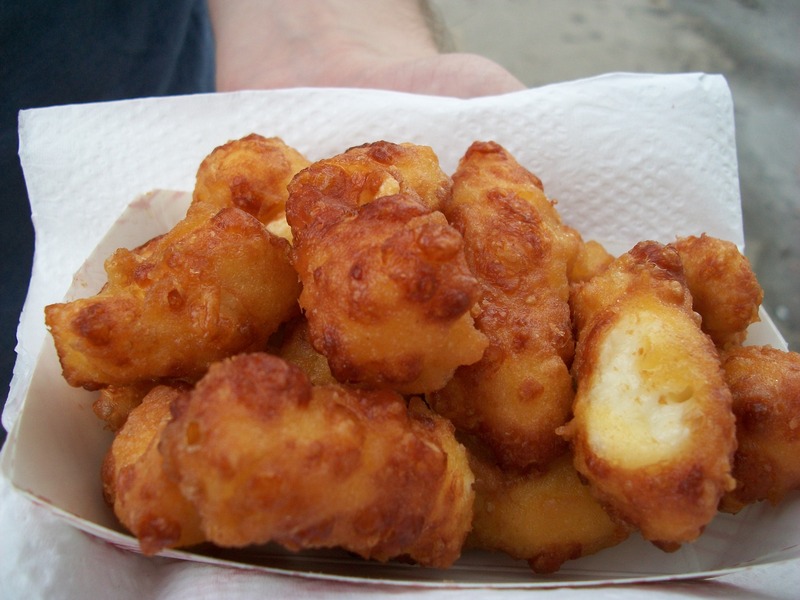 Ooh, a fish fry with fried cheese curds – never thought of that!